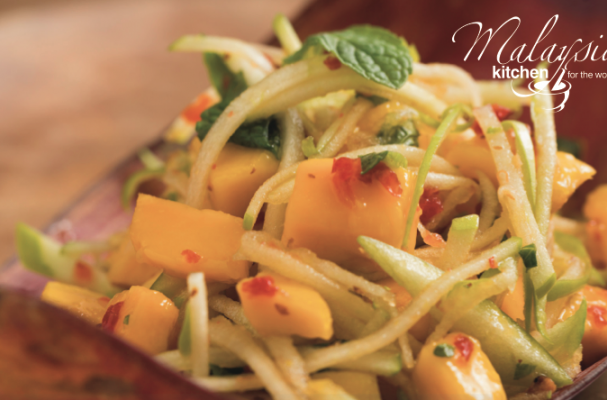 Green apple and mango salad is a spicy Malaysian twist on fruit salad. Unlike Western fruit salads, Asian fruit salads have a different flavor profile that hit a variety of notes on the palette - they are not simply sweet. Often they have a pop of chile, some zing from citrus juice (usually lime), and sweetness both from the fruit and palm sugar. The variety of textures and flavors awaken the tastebuds and expose the eater to a whole new range of tastes. Green apple and mango salad is usually served as a starter course, you can certainly transform it into a whole meal by adding succulent shrimp, juicy chicken, barbecued beef, or even deep fried tofu. Step 1: To prepare the dressing, combine the chilies, lime juice, fish sauce or salt and sugar in a bowl. Taste the flavor. It should be balanced between sweet, sour, salty and spicy. Add brown sugar a little at a time to balance flavors. Mix well and set aside. Step 2: To prepare the salad, combine the mango, apple, and mint leaves in a bowl. Pour in the dressing and toss. Step 3: Arrange the salad on a serving platter and garnish with toasted coconut. Serve immediately. *I like to add toasted chopped cashews to the salad. Flying Bread - Roti Canai or “flying bread” is the bread and butter of a typical Malaysian breakfast. The flaky griddled flatbread is typically enjoyed alongside a hot cup of pulled tea. Mee Goreng - This traditional Malaysian pasta dish is a blend of Indian spices and Asian condiments. Yellow egg noodles are stir-fried and tossed with sweet and salty soy sauces, madras curry powder, chicken, calamari, and beef. Malaysian Chicken Satay - Chicken breasts are seasoned with a medley of spices - cumin, cinnamon, coriander, curry, turmeric - and blended together with lemongrass and sugar for a marinade that's bursting with flavor.